The Capitals will rely on Andre Burakovsky and Evgeny Kuznetsov to provide secondary scoring this season. They both are products of the draft and were selected by former General Manager George McPhee. With Brian MacLellan at the helm, their development process stays very similar. They have some impact players awaiting their turn as they close out their junior seasons along with first year pros in the AHL gaining valuable experience. Below is THW’s Washington Capitals October prospect report. 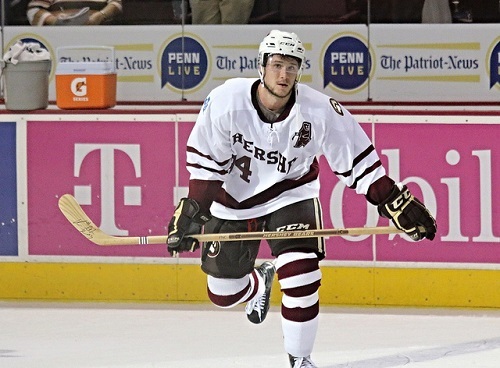 The Hershey Bears have gotten out to a strong start, beginning the season 6-4-1. They boast a younger, more prospect based team this season, earning a goal differential of plus ten to begin the year through eleven games. Their goaltending prospects have played well, but their young forwards have not provided a significant amount of offense to supplement the Bears’ top line scoring. Veteran center Kris Newbury leads the league with 16 points on the season. Nathan Walker: Troy Mann has placed Walker on the Bears’ top line in hopes of generating some offense. He skated with Tim Kennedy and Chris Brown in Hershey’s 3-2 overtime loss to the Wilkes-Barre/Scranton Penguins Friday night at Mohegan Sun Arena. Washington’s third round selection from the draft this summer has not recorded a shot on goal in three consecutive games. Chandler Stephenson: After a strong 2013-14 campaign with the Regina Pats in the WHL, Stephenson is beginning his first full season in professional hockey this year. He’s played with former Pat Garrett Mitchell on his line along with a rotating wing at times during this season and other combinations. His lone goal came against Lehigh Valley on October 26th. Garrett Mitchell: After missing the majority of last season due to injury, Mitchell been unable to find the back of the net consistently. He played on Hershey’s fourth line Friday night and has zero goals in 27 games since the 2013-14 season. Mitchell potted 15 goals during the 2012-13 under head coach Mark French, shooting near a 15% clip, far above his career average. Stanislav Galiev: After an injury that hampered a strong start to the season under then head coach Mike Haviland, Washington’s former third round pick has found himself out of the lineup with regularity. After playing in the team’s first four games to start the season, Galiev has played in just two of the Bears last seven games. Galiev has recorded a shot on goal in each game and contributed three shots on goal in Hershey’s road matchup against Manchester November 2nd. Tomas Kundratek: After having ACL surgery at the beginning of last season, Kundratek has had an admirable beginning to the 2014-15 season. Known for his ability to get the puck up the ice on the breakout and a lethal shot from the point, the Czech native has recorded a point in all but four of Hershey’s games this season. Kundratek ranks 3rd in scoring for AHL defensemen, contributing ten points on the season. Improving his game in the defensive zone will get him to the next level. Pheonix Copley: Signed as a college free agent last season, Copley has burst onto the scene in Hershey this season following injuries to Eddie Pasquale and Washington goalie prospect Brandon Anderson. He ranks sixth in the AHL in goals against (1.71) and recorded consecutive shutouts against Hartford and Lehigh Valley. Madison Bowey: After somewhat of a short stay in Capitals training camp, this former Capitals second round has continued to improve at the WHL level. If he was eligible to play in the AHL this season he would be there. He ranks sixth in WHL scoring with 26 points on the season and leads all defensemen in scoring in the league as well, four points above his closest competitor. He was also added to WHL’s roster for the Subway Super Series roster. Josh Morrissey and Nic Petan will serve as alternate captains for both Team WHL games vs. Russia. WPG's Madison Bowey to wear A in Game 1. Shane Gersich: Recently drafted over the summer, Gersich has been Omaha’s best player in the USHL to begin this season. He has a team high 46 shots on goal along with three power play goals to begin the 2014-15 campaign. Gersich ranks tenth in USHL scoring and is second in the league with nine goals. Russian Machine Never Breaks profiled his hot start in October. Riley Barber: Returning for his junior season as Miami University of Ohio, Washington’s former sixth round pick is off to another great start. Barber is averaging six shots on goal per game, but is connecting on just 5.6% of his shots, a trend that will likely change. Austin Czarnik and Riley Barber were back together as linemates for the first time this year last night. 1 assist for each. Travis Boyd: In his last season at Minnesota University, Travis Boyd has been one of the Capitals bright spots in the college game. He’s been dominant in the faceoff circle, winning 61.3% of his faceoffs. His potential role professionally is a bottom six forward who can play on the penalty kill and he continues to make strides. His contract situation will be interesting to watch as the season winds down. Stay tuned for more coverage of Capitals prospects as the 2014-15 season continues to progress.